On the western shores of what is now Italy, just south of Salerno, the Greeks settled and established a polis they called Poseidonia (the god of water and origin of the Roman god Neptune). Conquering Lucanians called the area Paistom near the end of the 5th century; the Romans later translated that into Paestum. The city was settled in a strategic spot on the Gulf of Salerno by a group of Dorians in the 7th century B.C.E. It flourished as a Grecian colony from the first half of the 6th century B.C.E. to the middle of the 5th century (560-440 B.C.E.). Poseidonia filled a trade and power vacuum in the 6th century, and it was during that "golden age" that its major monumental structures were built. The city became a religious center, and its growing architectural development was complemented by a rich cultural and artistic development. Polychromatic terra cotta statuary was created, along with fresco works. 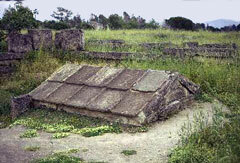 There are three main temples remaining in the plains of what was Poseidonia. In a line running from north to south, the northernmost temple was originally dedicated to Demeter, the Greek goddess of grain, and later adopted by the Romans in the worship of agriculture, renaming the god Ceres. The individual temple axis is always on an east-west line, with the entrance in the eastern end. Everyone now refers to this northern temple as "Ceres." Ceres follows the megaron concept of an inner chamber, the cella, surrounded by a porch, originally in front, then gradually - in some cases - developing into what is known as a peripteral concept, that of freestanding columns surrounding the cella. The Temple dates to about 510 B.C.E., and as we are about to observe, most Grecian temples had about twice as many columns on their longer sides than the shorter front and back; actually the usual ratio was one more on the side than twice the number on the front. Ceres fits perfectly into this equation with a 6 x 13 columnar ratio. When we get to the Parthenon, the ultimate Doric creation, we'll find an 8 x 17 ratio. Undoubtedly, these proportions result from the Greek obsession with prescribing proportions, which they dubbed as "ideal." Ceres, the interior, measures 14.5 x 33 meters (45' x 102'), is of the Doric Order, and sits on a three-stepped base. It's the smallest of the three temples here. 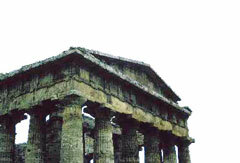 The older the temple, usually the heavier all of the proportions, the more bulbous the echinus, the closer the columns. As a matter of reference, the height of the columns is 5.4 meters (17'- 8 3/4") to the underside of the architrave (the horizontal beam resting on the capitals); the columns are 2.6 meters on center (8'-6"). Compare these dimensions with that of Hera II below. As time passed, and construction became a bit less conservative, columns became more slender and were spaced further apart. 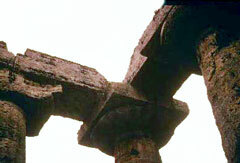 With the development of the Ionic and Corinthian Orders, columns became taller, by proportion. The entrance, with its three steps. Notice the close spacing of the columns. Ceres from the north, the “long” side, which runs east/west.. The abacus and echinus in perspective. Looking straight up at the capital. Going south, there is a path leading to what was an underground chamber, now mostly exposed, known as a sacellum (shrine). 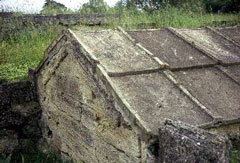 It is a fully roofed structure, with tiles covering a sloping roof, sitting on stone walls. This sacellum was consecrated to the deities of fertility. Rich utensils were placed inside - eight bronze and one black-figured vase. The vases are highly decorated, with the black one depicting a Bacchic scene. Apparently once built and filled, the single entrance was sealed from the outside and never reopened - until recent excavations began. Remnants of a Roman bath. The flooring was usually raised so that, in the case of a calidarium (steam room or sauna-like chamber), heat could be directed under the floor. Continuing south, we'll pass what had been a gymnasium, pool, amphitheatre, and forum, most of which date from the Roman occupation. The Romans took over the area in 273 B.C.E. More about that, and its tragic consequences, in a moment. Let's get back to the temples. Approximately 480 meters (1,500') from Ceres is the first of a pair of temples about 14 meters (45') apart. The first is known by a number of names. It was possibly dedicated to Hera, the sister and wife of the Greek mythological god Zeus. It might have been dedicated to Poseidon, in which case it has also assumed the Roman name for that god, Neptune. It's commonly referred to as Hera II, because the one next to it is called Hera I - sometimes. Apparently the "rediscovery" of Paestum in the 18th century by people who had to brave malarial swamps led those explorers to believe the temples could only have been dedicated to water gods. That's why you really have to detach yourself from your present moment when looking at things from antiquity. Further examination revealed terra cotta décor relating specifically to Hera. AND the area was dry when these constructions were built. More on this below. 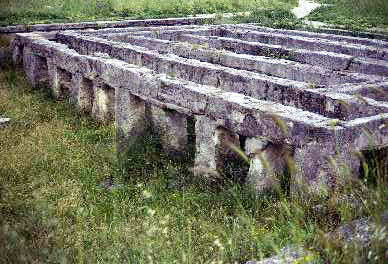 Hera II, showing one side of the naos, the inner sanctuary. 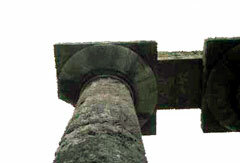 The internal row of columns originally had a second tier (see below). Hera II is the newest on the site, and dates from about 450 B.C.E. It is also Doric - all three are Doric here - and the columns are in a 6 x 14 ratio. It is often referred to as an Early Classic Temple. Slightly larger than Hera I (the third on our exploration, see below), the temple covers three times the area of Ceres, measuring 24.31 x 59.93 meters (80 x 196'). The ratio is 2:5, and that proportion found its way into all aspects of the design. This is the best preserved of the three temples. 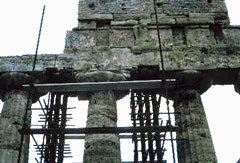 The columns measure 8.8 meters to the underside of their architrave (28'-10"), and are 4.3 meters on center (14'). 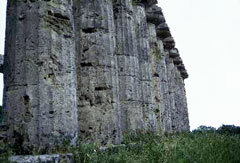 At Ceres, the height of the columns is 5.4 meters (17'-8 3/4"). Comparison with Ceres, therefore, tells us that the larger the construction, the taller the columns, when the number of columns on any particular side is about equal. You will see that there are 6 columns on the short side of Ceres, measuring 14 meters, and here we have 6 columns in a length of 24 meters. Point being that the temples were proportional with regards the parts to the whole. The wider the building in this case, the taller that building. This is something we will observe throughout our studies: the relationship of building parts to the entire building, and those parts to human beings. A basic principle here: parts of a building can relate to the entire building and/or to people; sometimes one or the other, sometimes both. The Greeks strove for unity in their design, with perfection of visuals, and this newest of the three, done in Early Classic times, went to extraordinary length to do just that. To show you an example of the reality in which Greek designers developed, consider the following. 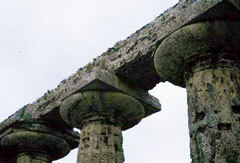 The columns along the long sides have a greater diameter than the columns on the short sides. This, of course, presented a problem to the designers - the reasoning behind the different diameters, if even known, should be left to a graduate course on the subject. What then to do with the corner columns? If kept smaller to present a balanced view to the entrance façade, they would appear diminutive when viewed from the long side. The solution was to create oval-shaped columns, which are viewed as equals to their short or long-sided neighbors. I did not know this when at the site, and was never aware of any discrepancy, attesting to the fact that the transfiguration worked. Such was the attention to detail. If nothing else, learn this from the Greek designers - that attention to detail in all facets of life is important. 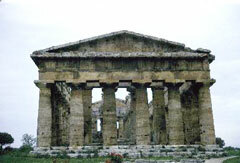 This temple was inspired by the Temple of Zeus at Olympia. It differs only in a few details, and the fact that the Temple of Zeus has thirteen columns on its sides and here there are fourteen. The variations and departures from the past culminated here in a building whose solids are equal to its voids, its positives to its negatives. This was a major design accomplishment, and presents an immense feeling of balance. Contributing to this sense of balance is the fact that the entablature, all of the construction above the columns, is in a much finer proportion to those columns; it is not "top-heavy,” as was Ceres. This is another instance of developmental refinement. This is the other side of the naos, and it shows there were two stories of columns inside this temple. The roof needed support, based on its internal layout of walls and columns. Since the Doric Order could only go so high based on its diameter, the architect had to resort to a row of columns literally standing on another row. Glimpsed between columns of Hera II, we see the last of the three temples, originally dubbed the "Basilica." Early excavators thought it was a "profane" building, not associated with any deity, but secular in nature. Subsequent excavations revealed evidence of an altar dedicated to the goddess Hera, and the building then became known as Hera I, but is commonly called the Basilica. Sufficiently confused? It's not my doing. I'm just here with some facts. The Basilica is the oldest, dating from about 550 B.C.E., and we've gone out of order time-wise just to stay in one direction as we walk through the site. It measures 24.5 x 54.3 meters (80'x178'), and has 9 columns on the short side and 18 on the long. 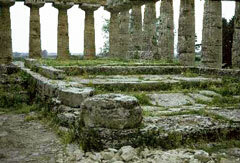 The nine is very unusual, and an odd number of columns on the short side are rarely found in Greek temples. Consider that an even number of columns provides an open space in the center, allowing easy and normal access when dealing with a symmetrical design. What's on the left is the same as the right; mirror images on either side of a centerline. Odd numbers produce a column dead center, and if you approach the building, influenced by its symmetry on center, you would walk right into that center column. It's like walking into someone's outstretched fist as you approach him or her, as opposed to open arms ready for a hug. Several unusual things here. 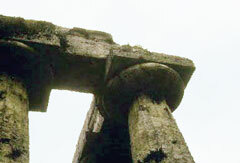 The top of the column, at the neck just below the echinus, is half the diameter of the base of the column. While columns had always tapered upward (following examples of tree trunks in original wood construction - except for Crete), this is an extreme case of narrowing. In addition, entasis, the swelling of the column, is manifested here for the first time. Further, the echinus is unusually bulgy, as if severely compressed. These design elements give a sense of life to the building, of plasticity, of weight being shifted, taken down to earth. A whole bunch of anomalies, as Trekkies sometimes observe. Speaking of Trekkies, if you are at all familiar with the ever-lasting TV sci-fi show (Star Trek), the Vulcans (fictional extraterrestrials) were into logic to about the same extent as the ancient Greeks - remember that business with the arches discussed earlier. You should be noting that none of the columns have bases, which was the rule in the Doric Order. Also, there was no mortar used in construction; metal straps held various stones in place at the four corners, the statically weak points in the construction. There's just a little more to this place called Paestum. It is the site of one of the earliest known man-made ecological disasters. Paestum had been supplying their Roman conquerors with masts for ships; masts made from Lucanian firs growing on the inland mountains. Rome's demands for more and more ships, first for military purposes, later for commerce, denuded the forest, and erosion set in. The rivers in the immediate plain began to flood the region. 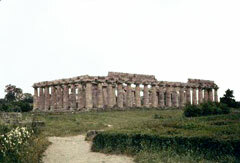 The people of Paestum tried to ward off the rising rivers. They raised the levels of their roads. Doorsteps and thresholds to homes and businesses were raised, and canals were dug to drain the waters. To no avail. Making matters worse, the waters were rich in calcareous substances, and the sediment left after flooding created a chalky layer often as thick as one-half meter (20"). 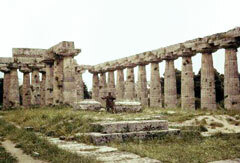 Paestum, in addition to its shipbuilding trade, had been an important center for commerce passing through between Rome and the East. The floods did not help matters, and Rome began to develop other trade routes. 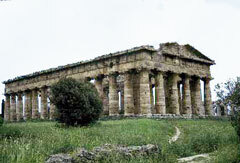 In any event, Paestum was bypassed in the 3rd century C.E. Grecian colonies in the area all suffered, as Rome built roads, which bypassed the coastal towns and went south. 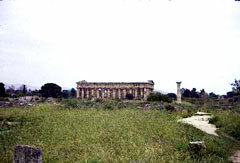 Paestum, which had been one of the most flourishing cities of Greater Greece, was forced by the stagnating waters to withdraw to the heights surrounding the Temple of Ceres. The people naturally turned to their pagan god, just in time to fight a defensive battle against Christianity, which was recognized as the Official State religion of the Holy Roman Empire. The locals lost, of course, and the first Christian church was built opposite the Temple of Ceres. Soon the Temple of Ceres itself was converted to a Christian church, seemingly as an act of consecration of the new religion. The flooding continued, however, and the plains became malarial swamps. 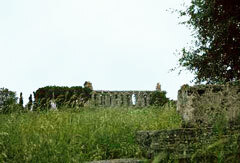 Saracen pirates scourged the shore, and the last inhabitants of Paestum fled to the hills in the 8th and 9th centuries. They took with them the local cult of Santa Maria del Granato, in which the Virgin Mary is depicted holding a pomegranate in her hand, much the same way as Hera had done in the beginning days of Paestum. Remember at the beginning of our discussions of Paestum we stated that the first temple we would look at was dedicated to Demeter, the Greek goddess representing agricultural products, primarily grain? Well, pomegranate has its origins in a Latin word for grain. And now you know the rest of the story!